Colorectal cancer is the second leading cause of cancer deaths in America, yet it’s highly treatable when caught in an early stage. Patients with colorectal cancer need an experienced surgeon like Dr. Babak Eghbalieh at Southern California Hepatobiliary Pancreatic & Robotic Surgery Institute, who is an expert in robot-assisted removal of colorectal cancer. Dr. Eghbalieh sees patients throughout the Southern California area, with offices in Valencia, Porter Ranch, and Sherman Oaks, California, and a new office opening in Los Angeles in the near future. Colon cancer occurs throughout the large intestine, but when cancer develops in the last 6 inches of the colon, it’s rectal cancer. As a result, you’ll often see the two referred to as one condition — colorectal cancer. 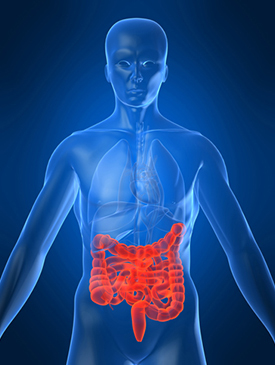 Colorectal cancer begins as benign (noncancerous) polyps that grow in the wall of the colon. It takes 10-20 years for the polyps to become cancerous, which is why colorectal cancer generally appears after the age of 50 years. This slow-growing cancer is preventable through colonoscopy screening which helps find and remove polyps before cancer develops. However, in a recent study, American Cancer Society researchers found new cases of colon and rectal cancer are occurring at an increasing rate among young and middle-aged adults in the U.S.
About 25% of the cases of colorectal cancer arise from a genetic component, so having a family history may increase your risk of developing colorectal cancer. However, its cause can’t be identified in most cases. You may also have a higher risk of developing colorectal cancer if you have a history of inflammatory bowel disease, type 2 diabetes, or you’ve been previously treated for prostate or testicular cancer. How does Dr. Eghbalieh treat colorectal cancer? After colorectal cancer is diagnosed, the cancer and part of the colon must be surgically removed. Dr. Eghbalieh is a highly-trained and experienced general surgeon, and a specialist in robotic surgery and minimally-invasive laparoscopic surgery. The doctor’s surgical expertise combined with the latest surgical instruments give patients a safe and effective option for removal of their colorectal cancer. When Dr. Eghbalieh performs robot-assisted surgery for colorectal cancer, the state-of-the-art device offers several advantages. It gives Dr. Eghbalieh a three-dimensional view of the colon, provides extreme steadiness during the procedure, and allows him to manipulate the highly-mobile robotic arms for meticulous cancer removal. Dr. Eghbalieh successfully reconnects the colon in most cases, depending on the location and severity of the cancer. Following robot-assisted minimally-invasive surgery, patients need less time to recover and have less pain than after conventional surgery.